Sharing on iWork.com: Apple provides this Web site, where you can invite others to view and comment on your Pages document. Click the iWork.com button on the Pages toolbar to get started, and the site will walk you through the rest of the process. Post your document on iWork.com. You’ll need an Internet connection to use iWork.com (naturally), as well as an Apple ID and a working Apple Mail account. If you didn’t create an Apple ID when buying your Mac or installing Snow Leopard, you can save the day by clicking the Create New Account button on the iWork.com site.. 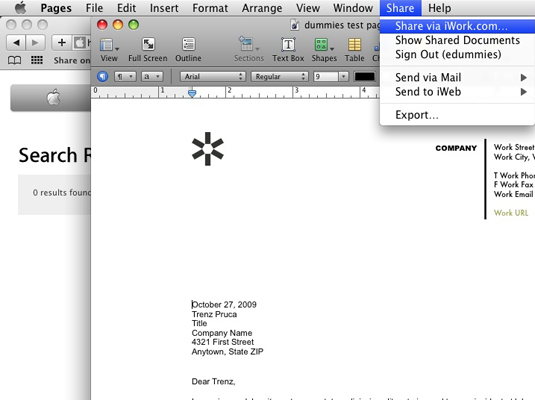 Sharing through e-mail: Click Share→Send via Mail, and you can choose to add your Pages document to a Mail message in three different formats: as a native Pages document file as a Word format document; or as a PDF file. After you’ve selected a format, Pages obligingly launches Apple Mail for you automatically and creates a new message, ready for you to address and send! The Share menu offers several sharing options. Exporting: Don’t forget that Pages can export your work in one of four different formats: a PDF document; a Word format document; an RTF (Rich Text Format) file; or even plain text. Click Share→Export, pick your format, click Next, and then select the location where Pages should save the file. Click Export and sit back while your favorite desktop publishing application does all the work. To keep your document as close to how it appears in Pages as possible, PDF or Word are you best choices. Your document will retain far more of your original formatting than an RTF or plain-text document would.